Mr Minx and I spent much of last year writing a book - Maryland's Chesapeake, How the Bay and Its Bounty Shaped a Cuisine. We're happy to announce that it is finally available for purchase! Today, August 1, is the official release date, so hopefully your MD-area bookstores have received it. 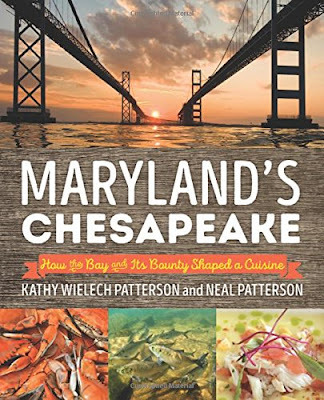 If not, and you're not averse to making online purchases, Amazon and Barnes & Noble are both stocking Maryland's Chesapeake. Both the fauna in the Chesapeake and the flora around it have greatly influenced the cuisine of Maryland. The Bay has sustained numerous generations of people, from the Native Americans to the British colonists to today's diverse population. Every summer, we look forward to the sweet corn, tomatoes and strawberries that are grown along the Chesapeake's shores. Long have we enjoyed the oysters, crabs, and rockfish from its waters. While Maryland's Chesapeake celebrates these delicious creatures, we hope it also serves as a reminder that unless we take steps to rejuvenate their populations and control pollution, eventually there may not be any of them left to eat. We hope to announce signing events in the near future, so stay tuned.